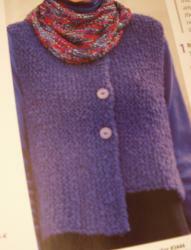 I've been working with the book The Knitting Experience: The Knit Stitch by Sally Melville. I decided to knit the Asymmetrical Vest, but since several of my friends whom I made look at the book didn't like the asymmetry, I fiddled the pattern so it would be symmetrical. I also wanted the vest to be 33 inches long instead of 24 inches long, and the way the pattern was described made it easy to change the length by adding stitches. I knitted it in 2 colors of Lion Brand Homespun (since I decided to add some stripes to it). When I finished it, it came out much longer than I expected and also less wide. I know my swatch gauge was off about 1/4" in one direction, but I thought it was the direction that would add width, not length. I guess I was wrong. I wouldn't be able to wear it myself without adding a front panel to it. So I had my sweetie kyubi model it for some photos. It fit her very well, and I guess she fell in love with it, because she wore it for the rest of the night. So once I have the buttons sewn on (in the photos, the things that look like buttons are stitch markers on the buttonholes), I'll be giving it to her. Vest front. ( kyubi, I'm sorry I chopped off your head!) It does look a bit asymmetrical, but that's just because of how it is hanging. It looks great, and I agree the asymmetry as designed didn't quite work (it looked like someone had buttoned it incorrectly). I find it much easier to make things for other people than for myself. I don't know why. This is the first knitted item I've given away. I've given away several crocheted items (I have more experience with crochet). But mostly I'm still at the stage of "wow, I made this! I have to keep it to prove that I did it..."
They fit. I can make adjustments on the fly for other people's body, but not for my own. Luckily, I like giving away the things I make. Each one is an adventure. I'm still utterly fascinated by the operation of people making clothing that people wear. It's so neat! Like, I mean, individuals, in their spare time. Perhaps you could learn to spin the yarn and such as a next project? It was certainly fascinating when annaoj was doing it at APC11. I gather that many yarn addicts eventually graduate to "the hard stuff" like spinning yarn, yes. I haven't gotten there yet, but I probably will someday. I did enjoy looking at and handling the fleeces at the Mendocino County Wool & Fiber Festival last year. In this post is a post including a photo of the prize-winning fleece sitting in its giant silver cup. Some wool/fiber festivals have contests called "sheep to shawl" where teams of people have some ridiculously small number of hours to shear a sheep, clean and card the wool, spin the wool, and then turn it into a finished garment. Heh. But it can't produce any more wool then. It's funny to run into this conversation here, because I was just talking about sheep-to-sweater or sheep-to-shawl contests with some friends a mere 48 hours ago. One person commented on how wool was a renewable resource, and contrasted this with a hypothetical "cow to couch" competition. I pointed out that the cow to couch competition would also have to be a barbeque. Heh! Doesn't leather take a long time to tan? It might be worse than watching paint dry. Thanks! I'm glad your first thing found a good home close by, too. oh, i am glad your sweetie likes it! it would be a shame if it hadn't found a home. i'm with the people who don't like that asymmetrical vest, though i am generally a big fan of asymmetry. i saw it at LYS, and to me it looked like a mistake, not a purposely designed garment.